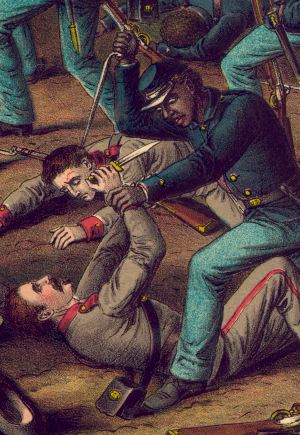 The assault on Battery Wagner: we so often look at that tense moment on a beach in South Carolina from the eyes of the men of the 54th Massachusetts. They hailed from all over the United States. Some were from Pennsylvania, Massachusets, Connecticut - born free and willing to risk it all for the freedom of others. Some were from the American South, former chattel property who had seized their freedom of their own accord. We rarely hop across that sandy embankment and try to get inside the minds of the men defending the works of Battery Wagner against assault on July 18th, 1863. Most of the infantrymen huddled in those sandy dunes, outnumbered by looming Federal forces, were sons of North Carolina. Imagine sitting with those men, glancing over the battlements at the waves of companies of the 54th Massachusetts forming on the beach, preparing to charge. What is that image? The 31st and 51st North Carolina hailed from all over low country North Carolina, a smattering of men from this county or that county making up each regiment. If you sat next to some men from Company A of the 51st North Carolina, who were from New Hanover County around Wilmington, the sight likely was a worst nightmare. Those men grew up in a county where 48% of the population was enslaved. When half the county are black men, women and children held in bond through force, a crowd of black men with guns is likely the boogeyman, the childhood fear lurking out behind the house or down the street. Wander down to Company B or C, whose men were a melange of soldiers from Duplin and Sampson counties likely would have had the same fears. In both Duplin and Sampson Counties, the slaves nearly equaled the free white population. They were an army of disgruntled property, a few abolitionist tracts or a militant Nat Turner-type away from descending on the slave holders and their white friends. Further down the parapet, the men of the 31st North Carolina glanced at those swarming black soldiers, likely with many of the same thoughts and fears. Their Lieutenant Colonel Edward R. Liles was barely in his 30s. When he joined the army and marched away from Wadesboro, North Carolina, he left behind his wife Helen and daughters Lillian, Inez and Laura. Joseph Wilson lived there with the family as well; his job was likely watching over their 15 slaves - 4 men and 11 women, ranging in age from 50 to 1 year old. Company D's men were no doubt turning to Captain Ruffin L. Bryant for inspiration and encouragement. The company commander was in his mid-thirties. His wife and three children were still home in Wake County. Whether his one slave, a 23 year old man, was still there isn't clear. Certainly glancing over the sand dune and seeing row after row of 23 year old black men, carrying guns and wearing the blue uniform of the United States government must have looked like all of slavery's sins returning with a vengeance. Somewhere nearby, James E. Todd was looking after his men in Company H. At home near Raleigh his father was still looking after the family's five slaves. Company G's commander Julian Picot likely glanced at those massing troops and flinched. At home, when the war broke out, he owned seven human beings as property who looked like those men. They were just a handful of his 28 slaves in Hertford County, with still more children and women milling around his no doubt bustling home. And now, his property was returning violence against the soul with violence against the body. Commanding the fort, looking out on his men and worrying about the odds stacked against him was Brigadier General William B. Taliaferro. The nephew of Secretary of War Seddon, Taliaferro was a distinguished Virginia statesman and veteran of the War with Mexico. He had attended both William and Mary College and Harvard University, but it didn't take an ivy league degree to work out the calculus of the coming battle. 5,000 men and 6 ironclad warships loomed beyond his walls. And some of those men were former slaves. Were any escaped from Taliaferro's Gloucester County, Virginia plantations? Certainly some of those men outside the fort's walls looked like the men who he left behind in 1861. There were 17 young men on his plantation in Virginia of the prime military age. And likely every one of them had more than enough reasons to enlist in the United States army and win freedom for four million. The Battle of Battery Wagner was not simply a battle in a simple civil war. It was, in many real and even more imagined ways, a kind of slave revolt. And for Taliaferro, slave rebellion was something he knew how to deal with well; the Brgiadier General had, just a handful of years before, commanded the militia in Harpers Ferry in the wake of John Brown's Raid. Fear can be a powerful force in battle. And when the USCT were martialed in battle, the very color of their skin could only serve as a potent multiplier for that fear. Lately I've felt like a broken record. I've been helping a friend workshop some posts for an upcoming anniversary (surprisingly for me, not a Civil War event but a deviation into the land of the Revolutionary War). And again and again, I find myself repeating some variation on a single nugget of interpretive wisdom. This is no fault of my colleague. I am often a broken record. So what has my advice been? It's simple, really. My friend has been following the historian's impulse, trying to share a complete story. She's been trying to include vivid detail, lush explanation, full proper names of British Generals and American Privates alike. It's such a natural impulse, too. You've gone to such amazing lengths to gather knowledge, to amass expertise, to become a bonafide know-it-all on a subject, you just need to spout that knowledge like a perverse history fountain. When you cram too much stuff into your head, of course you want to let everyone know everything everyday. But the fire hose is the cardinal sin of interpretation, the first pitfall which all interpreters are warned against. Interpredata, as David Larsen coined the concept, is not interpretation. It's simply chaining together fact after fact. So what to do then? If you can't tell a complete story, what could you do? My broken record chimes in: tell a meaningful story. Those two aims, telling the whole story and telling a meaningful story, are so often mutually exclusive. The completist impulse leads towards overloading the visitor, overburdening them with facts, figures, names, places and dates. Overloading them with precisely why they hated High School history in their teens: lists. But if you unlink the daisy chains of dates and the flow of events, if you pluck out small occurrences, tiny vignettes, little moments which can stand in for the whole, which typify the larger narrative, then you stand to begin helping visitors forge connections. I've written before about Anton Checkov and his potent rule of narrative. And so you might see this moment as another leap into that same old groove of the record. Eliminating the superfluous helps drive more keenly toward meaning and away from interpredata. But this is more than eliminating the useless facts and unfired guns. It's about even eliminating the semi-useful facts that might not have all too much bearing on the interpretive moment. Does a visitor need to know the unit a man served in? Maybe not. Do they need to know the Corps or name of the army his unit served in? That might not even have bearing. Anyone who speaks to me for more than a few minutes about interpretation likely hears another of my favorite phrases, another broken record: good history is just true fiction. I'm not advocating making things up. What I mean is that interpreters need to seek out stories and moments with the same potential impact as fiction. Using the tools of fiction, the construction of a narrative driven by suspense, drama, irony of situation and, above all else, vibrant characters. In most good fiction, things don't just happen, people do them. But we so often describe an army's actions in a largely detached and massive way. Armies don't march though. Men march. Armies don't fight. Men fight. Armies don't die. Men die. When I mention your favorite novel you probably don't remember scenes and actions as much as remember the vibrant characters who inhabit those scenes and make those actions happen. You likely remember who they are, how they think and how they bend when put under stress. And isn't that really a route to relevance moreso than intricate detail of 18th century combat's small actions? 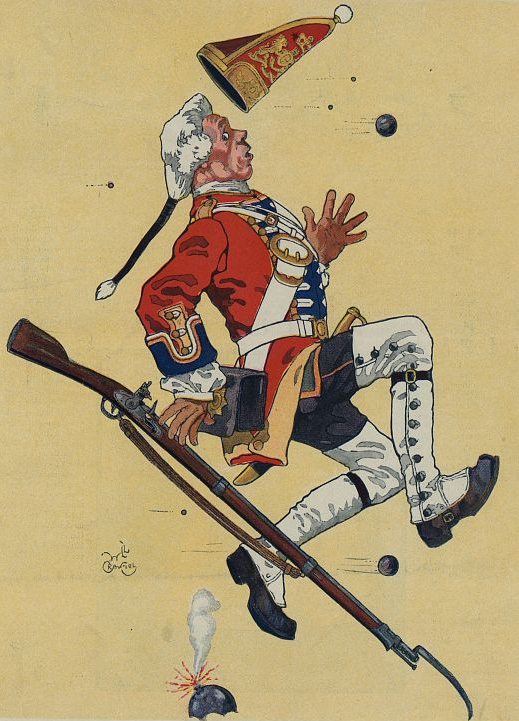 In the end (another broken record here), today's visitors will never need to command an army of a couple thousand farm boys from Connecticut and Massachusetts as they wield muzzle-loading smooth-bore French flint lock muskets against long neat lines of enemy force. Time doesn't move backwards; if it did, historians would be quickly out of a job. But today's visitors can find inspiration in the thoughts of the people of the past. They'll likely be under stress, and can draw inspiration from how the people of the past bent or broke under immense stressors. If the interpreter builds real people, crafts real character and lets audiences get to know them personally, today's people might begin to care. Remember, success in interpretation is not defined by, "did I include every last little detail?" Instead, it's typified by the question, "did they find a reason to care?" Education, if ever a goal of interpretation, is always a secondary impact rather than a primary motivation. Helping visitors find their own personal meanings in a landscape, to find a reason to love a place, to provoke them viscerally and emotionally within a landscape is the aim of interpretation. So breathe. Just keep reminding yourself that you don't have to tell the whole story, you just have to tell a meaningful story. Everything's going to be fine. Jacob and John Kitzmiller were brothers-in-arms, fighting through the thickets of Virginia with the 138th Pennsylvania. And spring of 1864 was one hell of a slog. The two boys were the youngest members of their family. When the war erupted, their mother and father, Samuel and Jane, lived alongside their daughter Catharine. Jacob was an apprentice blacksmith in B.G. Holabaugh's shop. John still lived at home with his parents. August of 1862, the brothers joined the army alongside dozens of other men from Adams County. Company B of the 138th was chock full of names which still bedeck Adams County's mailboxes and backroads. But while battle raged at home in July of 1863, while rebel bullets threatened mother, father and sister, the Kitzmiller boys found themselves guarding quartermaster stores en route to Washington alongside the Potomac. While men proved their mettle in the streets where the Kitzmillers grew up, they were guarding crates of hardtack and shelter halves. But the two brothers eventually found the war. The 138th Pennsylvania bounced around the Army of the Potomac, finally landing in the 6th Corps in time for the battle in the Wilderness in 1864. The men from Adams County charged through a tight bramble just north of Saunder's Field, while the forest roiled with smoke and fire in the chaotic battle. And somewhere in the fray, the two Kitzmillers stood in line of battle. Were Jacob and John near each other? Did they stand shoulder to shoulder, to brothers on an adventure. The blacksmith Jacob and his little brother John were somewhere in that hellish scene, the scent of brimstone from charred gunpowder curling through their nostrils. Then Jacob felt a sharp pain in his strong left arm. That muscle which had steadied hot iron against an anvil, learning the trade of the noble blacksmith, dangled limp and shattered. Tragedy had struck. Jacob lost his arm after being dragged to a field hospital. His war was over. But so was his life as he had imagined it. And John fought on alongside the Bieseckers and McCrearys and Deardorffs. His brother was no longer there. Was it harder? Where did he find the strength to keep on marching forward? War had stolen his brother's arm. And here John stood, still on the front line. He didn't have to fear for long. Almost as an afterthought, in the Compiler in the first few weeks of June, the notice ran. "A letter just received from Lieut. Earnshaw, of Co. B, 138th Reg., states the casualties in the company as follows: - Killed, John Kitzmiller." Just two years earlier, Kitzmiller's death might have warranted a full column of text, a eulogy for a young man destroyed in his prime. It might have called for fanfare, for pomp and circumstance. But reality had struck Gettysburg with a vengeance. For a town which had witnessed the deaths of 10,000 men, who had watched as three times that many others limped or rolled through their streets, what was one more lifeless form to be added to the grotesque pile? But the two boys weren't just lifeless forms. They were a son shattered and a son killed. For the Kitzmiller family in Gettysburg, 1863 may have been tough. But 1864 was an absolute tragedy. One insignificant name in a newspaper, hearing your son has lost his left arm, is enough to shatter a mother's heart, leave a father crippled with grief. Worrying over that young man, now missing his trade and writhing in pain in a Washington City hospital must be sheer agony for a mother. And agony becomes inconsolable when a second name, dropped nonchalantly by a typesetter in a newspaper office on Baltimore Street, reaches the Kitzmillers' eyes. Gettysburg might have been deadened to tragedy, but that didn't stop tragedy from squeezing its way through the tough exterior to shatter heart after heart in 1864.